University of Texas – Dallas (UTD) in preparation for the U.S. Final Four of Chess Tournament 2013, hosted the 2013 UT Dallas Spring FIDE Open, a 9-round Swiss System of ‘Standard’ Chess, underwritten by Turner Construction on March 9-13, 2013 at the Embassy Suites Dallas – Park Central, Dallas, Texas. 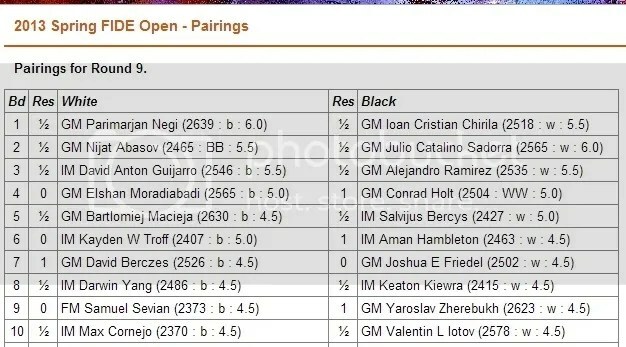 One of UTD student GM Julio Catalino ‘Ino’ Sadorra, a mainstay of UTD Team “A” from Philippines, who was seeded #6 out of a total of 43 FIDE rated participants (13-GM, 10-IM, 9-FM, 3-WIM & 1-WFM) from 18 countries/federations scored 6.5/9 (5Wins-3Draws-1Loss) with a ‘Rating performance’ (Rp) of 2623 tied for 1st place with the #1 seed GM Parimarjan Negi (IND)2639 who also submitted identical score after 9-rounds of play. The 26-year-old GM ‘Ino’ Sadorra (born 14 Sep 1986), who grow-up in Bacoor, Cavite, Philippines is a senior student at UTD and a Dean’s lister, who will be graduating this year with a degree in Business Administration (focusing on Entrepreneurship), had confided his short-term plan after graduation to chessaccount that of working for an established chess school and also looking forward to play & represent the Philippines in the 2014 Chess Olympiad and the Asian Games. 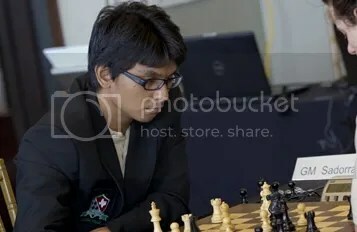 It can be recalled that GM Sadorra finished 2nd place at the 2012 Philippines National Chess Championship [also known as the Battle of Grandmasters (BOGM)] and was supposed to have qualified for the Istanbul 2012 Olympiad but had to begged off so he could concentrate on with his studies at UTD. 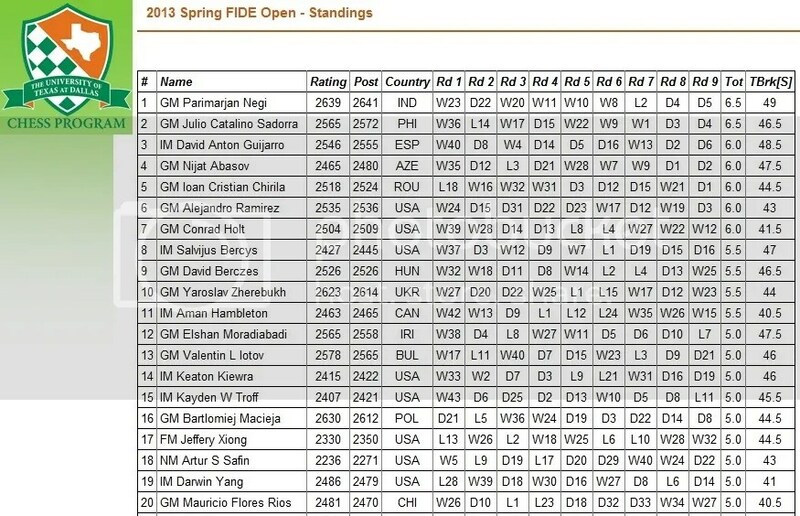 With his current official FIDE rating of 2565 as of March 2013 and his ‘Live Rating‘ of 2572.5 he now ranks as the #2 Top rated player of the Philippines. 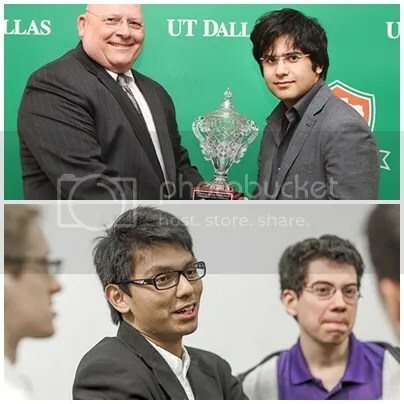 Another UTD senior student from the Philippines who is majoring in Computer Science, WIM Chardine Camacho, also a mainstay of UTD Women chess team and the #35 seed scored 4.5/9 (4Wins-1Draw-4Loss) and had a respectable finish at #26 overall.